Key options include immobilization, weight bearing restrictions, NSAIDS, orthotics, padding, and shoe modifications. The primary treatment goals for Freiberg’s disease are reducing or eliminating pain and maintaining a functional non-pathologic gait. A secondary goal is regression or cessation of progressive joint destruction although this is more likely to occur if treatment begins in the early stages. Conservative treatment methods are often sideline notes in studies reporting surgical intervention outcomes, and in fact, only one report specific to conservative management of Freiberg’s infarction utilizing ultrasound therapy was found in a review of the literature.6 This may be due to the progressive symptomatology and overt osseous destruction seen on radiographs in the later stages of the condition when conservative treatment has been reported to take longer and be less effective.20,21 Even if caught in the early stages, only a 60% efficacy in pain resolution occurring within 1 to 3 years of treatment in non-athletes has been reported with conservative management of Freiberg’s disease.21 Conservative treatment has been reported to be ineffective when loose bodies, Stage 4, are present.20 However, conservative therapy must be trialed and failed prior to proceeding with surgical intervention. Conservative treatment options for Freiberg’s infarction have included immobilization, weight bearing restrictions, nonsteroidal anti-inflammatory medication, orthotics, padding, shoe gear modification, ultrasound therapy, and steroid injections, with the latter being somewhat controversial in the literature.1,2,6-9,14,18 Pharmacotherapy, whether through systemic administration of non-steroidal anti-inflammatory medications or local steroid injections, may also help with symptom control although it is recommended that their use not be an isolated treatment but rather be done in conjunction with off-loading treatment modalities as they only target system relief. Protected mobilization and gradual return to activity are the two general phases of conservative treatment for any osteochondrosis.22 Protected immobilization of the affected foot can be accomplished through a variety of methods, such as cast immobilization, use of a removable walking boot or surgical shoe, or simply instruction on partial- or non-weight bearing. 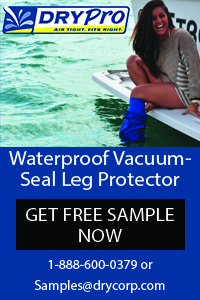 The period of protected mobilization typically ranges between 2 to 6 weeks or until symptoms resolve. Gradual return to activity can then be initiated. Only one report of ultrasound therapy for the treatment of Freiberg’s disease could be found in the literature, and the novel use of extracorporeal shockwave therapy may be the evolution of this treatment modality. While use of this treatment modality for Freiberg’s disease specifically has not been reported in the literature, mounting literature exists on its utility in the effective treatment of tendinopathies and other inflammatory conditions of the upper and lower extremities as well as fractures and cases of lower-extremity osteonecrosis.26 A systematic review of extracorporeal shockwave therapy for treating osteonecrosis of the femoral head found it to be safe and effective at relieving pain and improving motor function in the early stages of this condition.27 Pain relief was also noted after eight sessions of extracorporeal shockwave therapy (2000 pulses at a frequency of 5 Hz and pressure varied from 1.2 to 1.8 bars as tolerated by the patient) in an active adult male with a one-year history of pain related to avascular necrosis of the lateral sesamoid.28 While the exact mechanisms in which extracorporeal shockwave therapy assists in these conditions have not been determined, its safe and non-invasive nature make it a promising conservative treatment modality to explore further in the future. Freiberg’s disease, while an uncommon condition, should remain in the differential diagnosis for any forefoot pain to improve diagnosis in the earliest phase of the process. Osteochondrosis of the second metatarsal head can lead to progressive degeneration and deformity of the affected metatarsal phalangeal joint resulting in pain and limited forefoot function, which may severely affect a patient’s activity level and overall quality of life. Although there is no validated modality that exists to treat this condition, conservative treatment should be the first-line treatment no matter which stage at diagnosis, as it has lower risks than surgical intervention and can be very effective in relieving pain in the long term. Kerry Sweet, DPM, FACFAS, is a podiatrist with the Department of Veterans Affairs Puget Sound, in Seattle, WA. Rebecca Omana Daniels, DPM, is a podiatrist at Tripler Army Medical Center in Honolulu, HI. Valerie Marmolejo, DPM, is a medical writer and clinical wound specialist at West, LifeNet Health in University Place, WA. Disclaimer: The views expressed are those of the author(s) and do not reflect the official policy of the Department of the Army, the Department of Defense, the US government, or LifeNet Health. Freiberg AH. The so-called infraction of the second metatarsal bone. J Bone Joint Surg 1926;8(2):257–261. 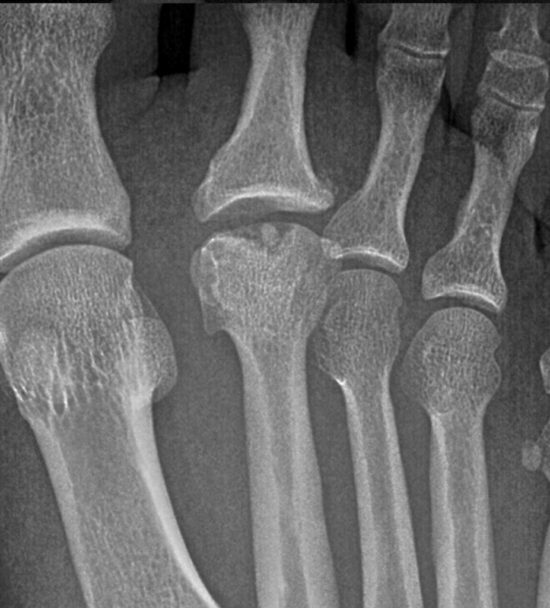 Lewin P. Juvenile deforming metatarsophalangeal osteochondritis: Freiberg’s infraction of the metatarsal head. JAMA 1923;81(3):189–192. Nguyen VD, Keh RA, Daehler RW. Freiberg’s disease in diabetes mellitus. Skeletal Radiol 1991;20(6):425–428. Walsh HP, Dorgan JC. Etiology of Freiberg’s disease: ? trauma. J Foot Surg 1988;27(3):243–244. Atanda A Jr, Shah SA, O’Brien K. Osteochondrosis: common causes of pain in growing bones. Am Fam Physician 2011;83(3):285–91. Arnold AI. Freiberg’s infraction: its sequelae and treatment with ultrasound therapy. J Natl Assoc Chirop 1957;47(5):240–241. Cerrato RA. Freiberg’s disease. 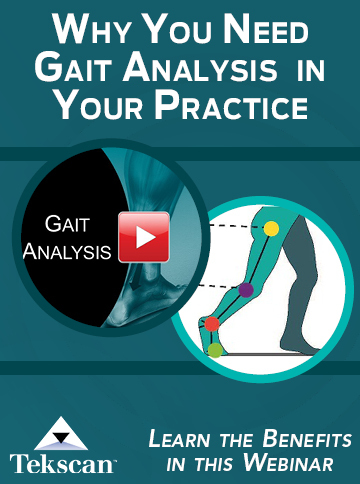 Foot Ankle Clin 2011;16(4):647–658. Al-Ashhab MEA, Kandel WA, Risk AS. A simple surgical technique for treatment of Freiberg’s disease. The Foot 2013;23(1):29–33. Katcherian DA. Treatment of Freiberg’s disease. Orthop Clin North Am 1994;25(1):69–81. Talusan PG, Diaz-Collado PJ, Reach JS Jr. Freiberg’s infraction: diagnosis and treatment. Foot Ankle Spec 2014;7(1):52–56. Blitz NM, Yu JH. Freiberg’s infraction in identical twins: a case report. J Foot Ankle Surg. 2005;44(3):218–221. Scartozzi G, Schram A, Janigian J. Freiberg’s infraction of the second metatarsal head with formation of multiple loose bodies. J Foot Surg. 1989;28(3):195–199. Binek R, Levinsohn EM, Bersani F, Rubenstein H. Freiberg disease complicating unrelated trauma. Orthopedics 1988;11(5):753–757. Kehr LE. A new surgical technique for the correction of Freiberg’s deformity. J Am Podiatry Assoc 1982;72(3):130–134. Helal B, Gibb P. Freiberg’s disease: a suggested pattern of management. Foot Ankle. 1987;8(3):94–102. Panner HJ. A peculiar characteristic metatarsal disease. Acta Radiol 1922;1(2):319–333. Miller ML, Lenet MD, Sherman M. Surgical treatment of Freiberg’s infraction with the use of total joint replacement arthroplasty. J Foot Surg. 1984;23(1):35–40. Smillie IS. Freiberg’s infraction Köhler’s second disease. J Bone Joint Surg Br 1957;39:580. Freiberg AH. Infraction of the second metatarsal bone: a typical injury. Surg Gynecol Obstet 1914;19:191–193. Ary KR Jr, Turnbo M. Freiberg’s infraction: an osteochondritis of the metatarsal head. J Am Podiatry Assoc 1979;69(2):131–132. Omer GE Jr. Primary articular Osteochondrosis. Clin Orthop Relat Res 1981;158:33–40. 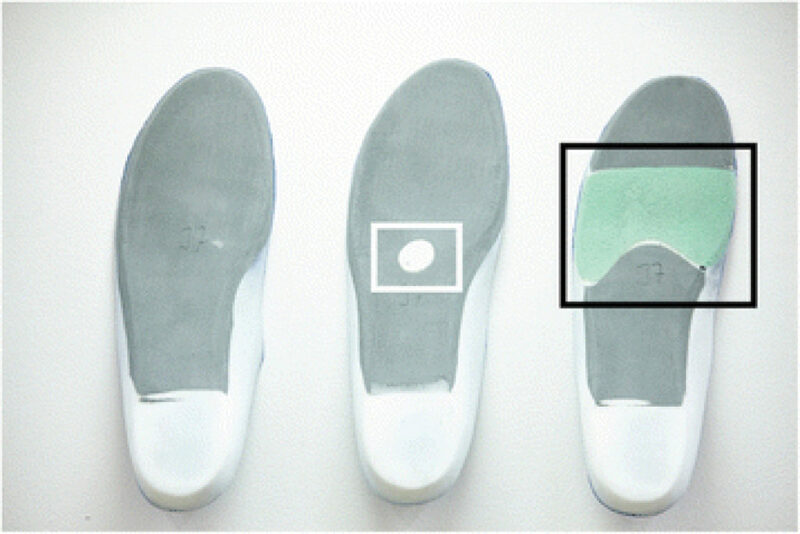 Hähni M, Hirschmüller A, Baur H. The effect of foot orthoses with forefoot cushioning or metatarsal pad on forefoot peak plantar pressure in running. J Foot Ankle Res 2016;9:44. Sobhani S, van den Heuvel E, Bredeweg S, et al. Effect of rocker shoes on plantar pressure pattern in healthy female runners. Gait Posture. 2014;39(3):920–925. Brown D, Wertsch JJ, Harris GF, et al. 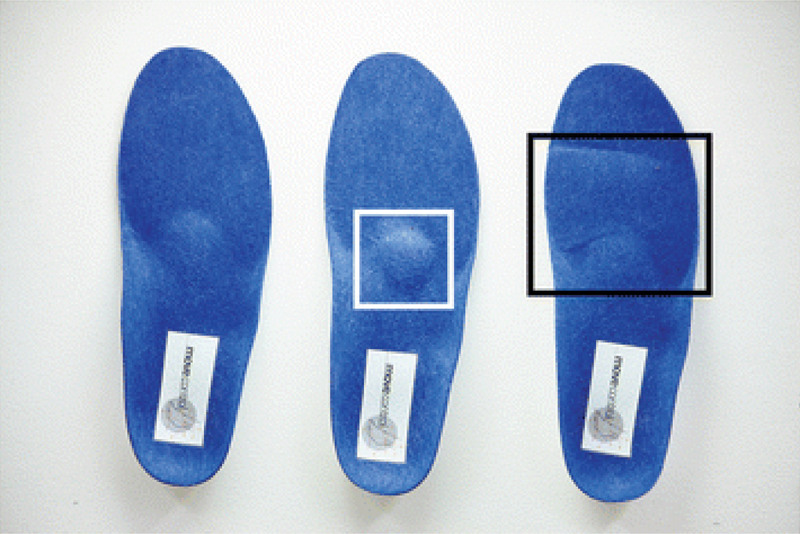 Effect of rocker soles on plantar pressures. 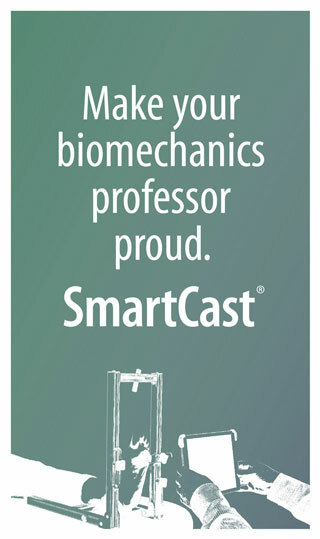 Arch Phys Med Rehabil 2004;85(1):81–86. Wang CJ. Extracorporeal shockwave therapy in musculoskeletal disorders. J Orthop Surg Res. 2012;7:11. Zhang Q, Liu L, Sun W, et al. Extracorporeal shockwave therapy in osteonecrosis of femoral head: A systematic review of now available clinical evidences. Medicine (Baltimore) 2017;96(4):e5897. Thompson D, Malliaropoulos N, Padhiar N. Sesamoid osteonecrosis treated with radial extracorporeal shock wave therapy. BMJ Case Rep 2017;2017.